"Consuetudo Peregrinadis — the habit of wandering is endemic in cats" might be the theme of this mystical novel and it would surprise no one. Instead the theme is that of a cat who is a philosopher, not the cat of a philosopher. Lucas Fysst (rhymes with "diced" not "Christ" — that would be irreverent, Lucas claims) is an historian of science who had unearthed and dutifully researched an ancient Irish poem c. 900 AD about a Celtic monk's cat named Pangur Ban. 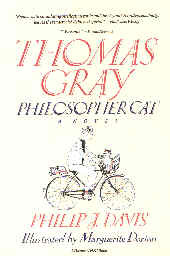 When the title cat appears in Lucas' world he names her Thomas Gray after the famous "Elegy in a Country Churchyard" poet who wrote a poem about his cat that died in a vat of goldfish and, by the way, had a conscious tail. He named this peregrine cat Thomas Gray, but he affectionately called her Pangur Ban - which may mean "furry white" unless you punctuate the name Pan Gurban which turns the furry feline into a hairy hunchback, an abomination that Lucas considered more irreverent and less poetical. Thomas Gray's subsequent disappearance (one of many) from the Halls of Cambridge brings sadness to the dons, commentary by the Prime Minister during Questions, and the lowering of the Pembroke flag for an hour. But Dr. Redding spies Thomas in King's Lynn and the chase is afoot. Lucas retraces Redding's exact steps, including ordering gooseberry fool from the waitress who Redding only remembered as having a name beginning with a 'B.' After a lot of fool and fooling around, Miss B. becomes Mrs. Fysst and Lucas discovers Thomas Gray once more on a scow in the Wash off King's Lynn. She wants to retrace her grandmother Katrina's quintessential experience of the specific wavelet out of the myriad of general wavelets on the rippling sea. To discover for herself infinity in the gap between the specific and the general. Once having done so, she can rest at peace, with occasional peregrinations, of which we shall not speak, in the home of Mr. and Mrs. Lucas Fysst. A delightful novel from beginning to end — most likely to surprise those who think of cats as untrainable dogs and are embarrassed by the thought of having coming into possession of a whole book about one.